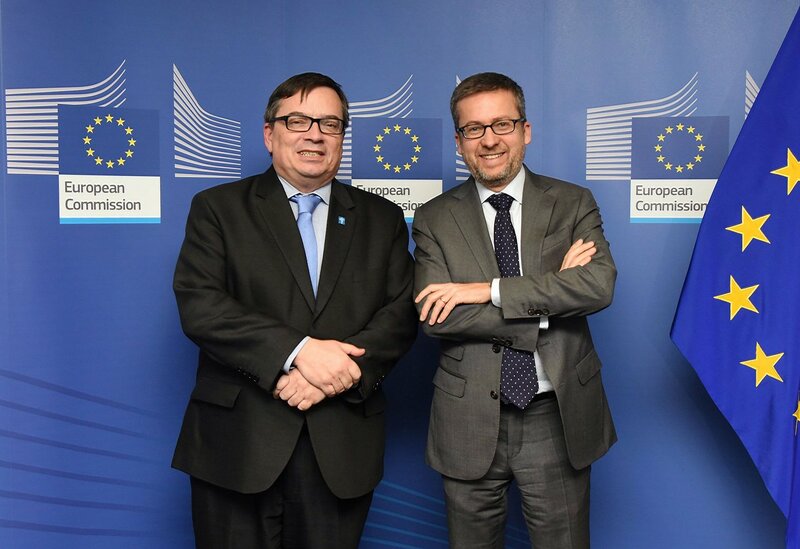 On 19 December 2017 in Brussels, ESO’s Director General, Xavier Barcons, met the European Commissioner for Research, Science and Innovation, Carlos Moedas, and the EC Director-General of Research and Innovation, Robert-Jan Smits. The Commissioner and ESO Director General discussed ways to reinforce the relationship between the European Commission and ESO in order to further the development of fundamental science across the European Research Area. ESO’s role as the main driver for ground-based astronomy in Europe gives it a unique responsibility to ensure that collaboration in astronomy infrastructure, instrumentation and science is well-fostered. The meeting addressed the development of the European Strategy Forum for Research Infrastructures (ESFRI) which currently lists ESO’s Extremely Large Telescope as a landmark European infrastructure. ESO’s Director General also offered ESO’s expertise towards supporting the governance of the European Open Science Cloud (EOSC) initiative and in particular with helping to improve the stewardship of archive data in order to enable further scientific discoveries. On behalf of the ASTRONET consortium, the ESO Director General delivered a position paper to Commissioner Moedas on the next EU funding programme, FP9, the successor to the current 80 billion € Horizon 2020. ASTRONET is a partnership of eight organisations from European states, including ESO, which provides a forum for the strategic coordination of European astronomy. ASTRONET is preparing to develop the next European Science Vision and Infrastructure Roadmap for Astronomy, following on from the success of the original 2007 version, which was updated in 2013.